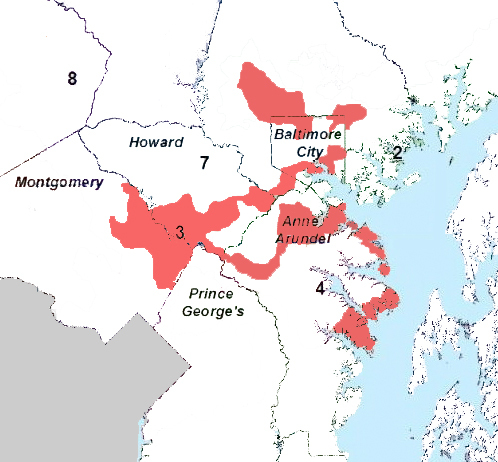 Maryland's 3rd congressional district, considered the second most gerrymandered and non-compact district in the nation. Graphic by MarylandReporter.com. There are so many things wrong with how legislative and congressional districts are drawn in Maryland and across the United States that it is hard to know where to begin. The place to start is fairness. The current process is egregiously unfair to average voters who would like to choose their representatives and not have their legislators choose them. It is unfair to minorities of every stripe: not just Republicans, but blacks, Latinos and residents of all persuasions in counties with no business being cut up into so three and four districts. That’s how we get to a situation where more than half of Maryland’s congressional delegation, live within a 10 mile radius of Towson. That’s six out of 10 members of the U.S. Senate and House including both senators and the lone Republican, four in Baltimore County and two in the city. Barry Rascovar’s column this week argues that somehow the current process is sort of fair to Republicans based on statewide party registration as a guide to fair representation. And the notion that Gov. Larry Hogan’s push for an independent nonpartisan commission is based on partisan political gain is only accurate in so far as Republicans and other minorities would indeed gain representation if they were treated fairly. Using party registration as a gauge of voter sentiment and partisan strength is bogus. The real test of partisan strength is how people actually vote. With the exception of Hogan’s 51% win, in statewide races in Maryland’s last six elections, Republicans have gotten 36 to 46% of the vote, even with weak candidates. Not even the strongest Democrats — Barbara Mikulski and Barack Obama — have gotten more that 62% of the vote. Translating this into congressional representation, Republicans would have a fighting chance for three out of Maryland’s eight members, not just one or two as they do now. If lines were drawn fairly, paying attention to geography, compactness and political boundaries as even Maryland’s state legislative districts must do, Republican-leaning Anne Arundel County, on its way to surpassing Baltimore City in population, would have its own resident member of Congress as it once did, not the four Democrats who live miles away in three other counties. More fairly drawn lines for the General Assembly, along with single-member districts for every delegate as proposed by a state constitutional convention in 1967, would lead to three to seven more Republicans in the House of Delegates and four more GOP state senators. Democrats would still be in overwhelming control, but Republicans could block more legislation. The principal argument against this sort of fairness is that Maryland Democrats should not unilaterally disarm while Republicans in other states continue to gerrymander with impunity. This is the two wrongs make a right argument. Dems and minorities are mistreated by the GOP elsewhere, so we need to keep mistreating Republicans here, fairness be damned. Democrat legislative leaders will fight any change vigorously — unless Larry Hogan wins a second term in 2018, leaving him in control of the redistricting process after the 2020 Census. They will do everything they can to prevent that, as the lashback over the Red Line has shown. But there might be another option that Samantha Lachman of the Huffington Post laid out in article last Wednesday. Both Hogan and Virginia Democratic Gov. Terry McAuliffe would like see independent commissions to overcome the partisan gerrymandering that is screwing Republicans in Maryland and Democrats in Virginia. Rather that unilaterally give up this political weapon, might the two states, long both rivals and partners over the centuries, make a pact to give up partisan gerrymandering so that all its citizens get treated fairly? That’s a bit far-fetched, but no more than a Hogan second term.